The 15/6 Stelvio was essentially the same as the preceeding 14/6 Stelvio, albeit with the larger engine fitted. It was a very slow seller, and was dropped when the model range was refreshed at the end of 1935. However, perhaps due to the slow sales, it appears that some were not registered until 1936. The car carried chassis numbers taken from the old 14/6 range, but with a 15S prefix, indeed the chassis was essentially the old 14/6 chassis, rather than the new 15/6 version. As those that have been identified were all numbered in the range 930-960, it appears that the chassis may have been built up and set aside much earlier and then used as required, the last being registered in 1936. It would also suggest that only around 30 were produced. 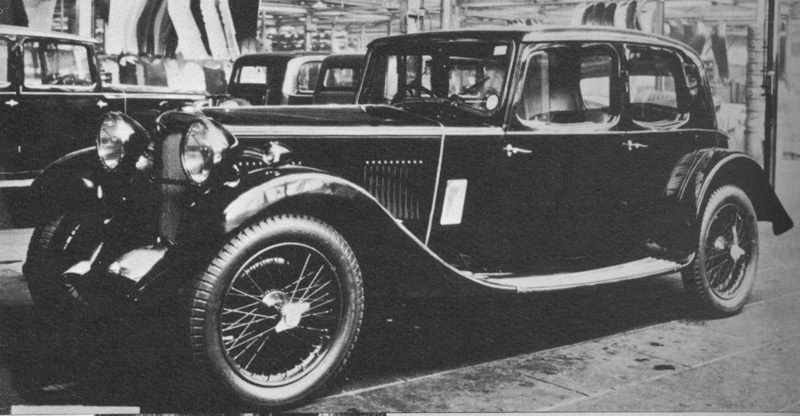 This was the last of the early coachbuilt models, having originally been produced by Weymanns, all subsequent Riley bodies being designed and built in house or by Briggs. The engine, whilst bored out to the large 15/6 size, bore more in common to the 14/6 in other respects, making it a curious halfway house, only fitted to the Stelvio, Winchester and MPH models. The Stelvio's replacement was the Falcon, as the new top of the range Saloon. Firing Order1, 5, 3, 6, 2, 4. Wheels Six stud mountings wire 3.0x20"